Love the natural sweetener honey? Then here is another good news for you. Honey is good for your skin too. Do you know this? Yes. Honey makes your skin look pretty beautiful. So, prepare your own honey face mask with the common kitchen things. You can use honey for acne, pimples, dry skin, and what not!!! So, don’t miss these facials with honey. Just jump to the below sections and get them. Honey is not only good for health, but there are also several benefits of honey for face, skin, etc. So, let us know how to make a honey mask for the face. Look at the below homemade honey facial masks. The oily skin is an acne-prone skin. Because the hyperactive sebaceous glands produce, excess sebum makes your skin oily. This leads to the occurrence of acne. So, to get rid of acne on your face, try the below honey mask for acne-prone skin. Mix all the ingredients and apply the mixture on your face. Let it rest on the face for about 10 minutes. Now, wash it off with warm water. Draws out the impurities on the skin. Makes your skin radiant and soft. Nourishes the skin and heals skin blemishes. Honey – 2 to 3 tbsps. Carrots – 2 to 3. Firstly, cook the carrots and mash them into a soft paste. Now, add honey to it and chill it in the refrigerator for 10 minutes. Then apply the mask on your face and let it dry for 10 minutes. Wash it off with cool water. Carrot is a rich source of vitamin A which is an antioxidant. It fights against the free radicals. Hence it prevents wrinkles, uneven skin tone, aging of the skin, and pigmentation. The Beta-carotene in carrot repairs the skin tissues. So, you can try this carrot and honey face mask regularly to get a healthy and beautiful skin. If you have dry skin, then here are the best masks with honey for dry skin. Lack of moisture or dryness in the skin makes your skin look dull. During the seasons of cold climate, the problem gets worse. 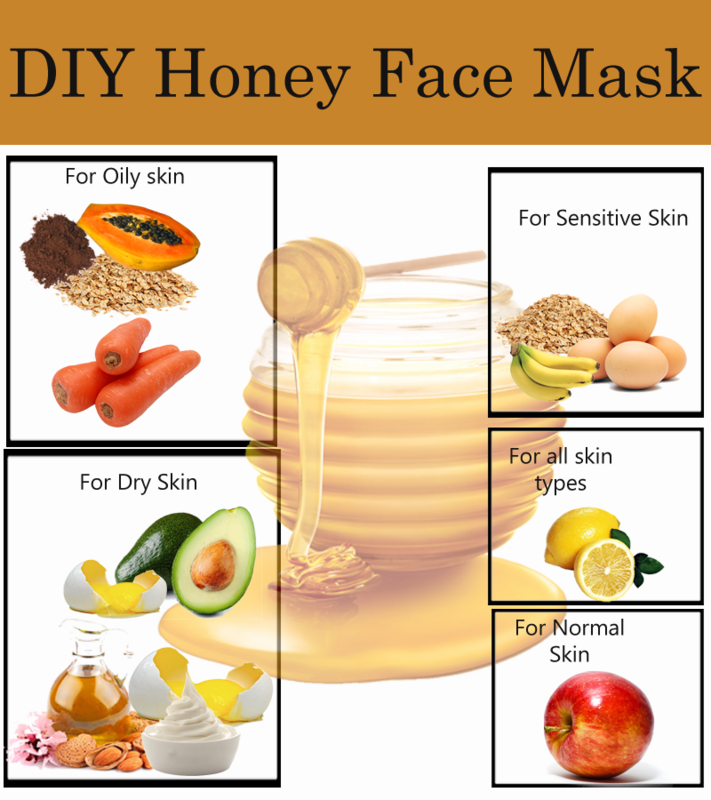 So, to treat dry skin, follow the below honey facial mask and moreover know how is honey good for dry skin. Avocado flesh – 2 tbsps. Mix all the ingredients in a blender or mash them with your hand in a bowl. Apply the pack on the face and neck with your fingers. Leave it on for about 30 minutes and some more time if you can. Now, wash the face with normal water. You should try this honey face mask because of the following benefits of avocado for skin. Protects the skin from aging, wrinkles, fine lines. Improves skin density, thickness, and tone. Reduces the effects of longtime sun exposure. Keeps the skin soft and hydrated. Reduces facial redness and irritation. Almond Oil – 1/2 teaspoon. Add all these ingredients in a bowl and stir them to form a thick paste. Spread this mask over the face. Let it rest for 5 minutes and wash it thoroughly with a mild soap. The benefits of using this face mask with honey are the following. Stimulates and smoothens the skin. Moisturizes the skin from the inside. Cleans and make the skin pores tight. Also, lightens your skin and improves the skin tone. Even though your skin is a normal type, you may have a chance of pimples, uneven skin tone, etc. Right? So, to have a beautiful and glowing skin, regular skin care is necessary. Include honey in your daily facial skin care routine to get immediate results. Take a look at the below honey face mask for normal skin. Chop an apple into fine pieces or add the apple pieces into a food processor. Now, add honey to the apple mixture. You’ll get a pack with a rough texture. Refrigerate it for 10 minutes and apply the paste onto your face. Let it rest for 30 minutes and wash off. But why should you use this apple and honey mask for the face? The antioxidant properties of apple relieve any damage from the sun. Exfoliates and clears the pores. Moreover, it helps to get rid of the bacteria on the skin. Is your skin very sensitive? Then you might be worrying about what to use on your skin. Because when you use any homemade products or skin care products, it causes burning, redness of the skin. This makes you feel very uncomfortable. So, to ease those effects here is a natural solution for sensitive skin with honey. Cook the oatmeal with milk and add the banana mash, egg, honey to it. Mix all the ingredients and apply it on the face. Have a massage in circular motions with your fingers and let it rest for 15 minutes. Wash it off with tepid water. But do you know you should use this honey face mask? Cleans and heals your skin. Eggs are a source of lecithin which is a skin emollient. The antioxidants of banana protect the skin from free radicals. Prevents wrinkles, lines on the face. Mix both the ingredients and prepare a lemon and honey mask. Apply it on the face and have a nice massage. Leave it on for 20 to 30 minutes. Then clean your face with water. No doubt there are several benefits with the honey lemon face mask. Keeps the skin supple and glowing. Maintains the skin fresh and smooth. Treats acne, sunburn, and blemishes. So, these are the simple homemade honey face mask recipes. Try them regularly and get your pretty face. But if you feel any irritation to any of the above ingredients, try not to use them again. Previous articleHow to Get rid of pimple marks naturally? Next articleHow to get rid of muscle cramps naturally?